Sorry the country description is blank, but we are busy finding more great beers from around the world to bring you. Check back here soon. 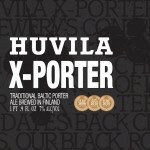 X Porter is Huvila’s version of the traditional Baltic Porter style that dates back to the 18th Century. They’ve combined local brewing ingredients with British hops and roasted grains to create this robust, black, and balanced porter.